We at DPS Megacity, Kolkata believe that we have to help pupils learn to make good choices. The ultimate aim of the positive behavior management is self discipline in students instead of authority imposed control. The programme rests on the belief that students are rational being capable of controlling their own behavior. The Principal, Headmistresses, consultant psychologist, PBM committee members and class teachers are all involved in a comprehensive plan to help child develop self discipline. For this green slips are issued to students as positive motivation for any good deed of a student. It provides immense encouragement to students. 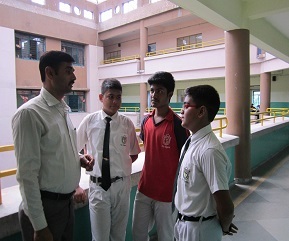 Workshops are conducted in the school to teach students about various life skills. Pink slips are issued to students when he or she misbehaves ore breaks school rules. Pink slips are correctional slips. After three such correctional slips a letter from the Principal is sent to the guardians of the students informing and involving them to monitor and supervise the child. A student teacher contract is signed after that. Behaviour Mangement cards also known as discipline cards are given for misdemeanours. Our psychologist has designed logical consequences to misdemeanours that includes reflective writing, student teacher contracts, individual counseling, parental involment continuous counseling to the student by the Principal, Headmistress, councellor, PBM members and the class teachers. This continuous process constantly motivates students to do give their best. It provides constant monitoring and helps them to realize and learn.The individuality of a child is nurtured, at the same time he is taught to choose wisely.